Welcome to i3Factory.com Music World. 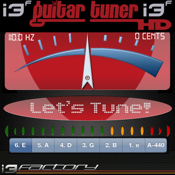 Guitar Tuner i3F in Version HD for Ipad. Based on Fourier Algoritm is one of the best Tuner in the market, probably the most simple to use. This Tuner have an oscilloscope and you can see the wave sound on the iPad. With this very easy to use guitar tuner you can tune your personal guitar and bass. The device listen the strings of your guitar helping your finger to tune the six guitar strings. A very sofisticaded algorithm is in the core of owr usefull tool.